This past weekend was Apple Blossom here in Payette. Ty had the weekend off and was able to enjoy the town's festivities with us this year which was great! They have a fun parade where the kids loaded up on candy. Vanna was an absolute sticky mess by the end of the parade - she couldn't shove that taffy in her mouth fast enough. After the parade, we received a sweet invite to a bbq with friends and enjoyed the entire afternoon with them. We thought for certain the kids would be monsters while we were there as we were already getting passed their nap times but they did great and couldn't have had more fun playing with all the kids that were there. When we finally loaded them in the car to go home, they fell asleep within what seemed like seconds. They enjoyed a late nap which we thought would be perfect because we still had the carnival and fireworks to go to. Well, we should have known better than to plan that much fun into one day because the monsters DID come out as we left the carnival. :) Cash had a complete meltdown because as we were leaving, he came across a glow-in-the-dark sword he'd seen and NO amount of convincing (that he'd already had loads of candy, played with friends, rode rides at the carnival, etc.) could persuade him otherwise. Needless to say, we left the carnival frustrated and determined not to go back next year. We also figured we'd skip out on the fireworks (my favorite part of the festivities-tear) as we were approaching the kids' bed times and weren't about to encourage more meltdowns of the same magnitude. We defintely had over-exhausted kids by that time already. Oh, but it really was a fun day and a great time we had together as a family. I've often thought, "what would we do if we didn't have kids to entertain or kids to entertain us (yes, even meltdowns can be quite entertaining and comical)?" We definitely have a good time with them. I was asked to speak in our ward for Mother's Day, on the topic of "The Privilege Of Being A Mother". I truly felt rejuvinated after studying so many wonderful talks on the topic and thought I'd share some of the things I came across and the things that have occupied my mind over that same subject as of late. Warning: It will be a long read - I simply cut and pasted almost my entire talk. "Look to your mother. Model yourselves after them... Learn from her strengths, her courage, and her faithfulness. Love your mother, ...Respect her. Listen to her. Trust her. When it comes to matters of the heart and the things of the Lord, she has a wealth of knowledge." I’ve studied that talk and as a result, have again looked to my mother and reflected upon our relationship, as I often do. My mother has been through more enormous trials than I ever desire to go through and I can say that she is strong, she is faithful, she is wise. I do respect my mother, I trust my mother, I love my mother. I can agree whole heartedly with the famous quote by Abraham Lincoln: "All that I am, or hope to be, I owe to my angel mother." "Just follow your mothers! They know where they’re going! They’ve been down this road before!" "There is no greater good in all the world than motherhood. The influence of a mother in the lives of her children is beyond calculation" ("Fathers, Mothers, Marriage," Liahona and Ensign, Aug. 2004, 3). After hearing these talks, I felt a tremendous weight upon my shoulders as the Spirit whispered to me of the responsibility that is mine - to be the kind of mother my children can and should look to as an example, a teacher, a nurturer, and the many other titles you could give a mother. To be the kind of mother mine is to me. "...her anxiety tended to come on three fronts. One was that whenever she heard talks on LDS motherhood, she worried because she felt she didn’t measure up or somehow wasn’t going to be equal to the task. Secondly, she felt like the world expected her to teach her children reading, writing, interior design, Latin, calculus, and the Internet—all before the baby said something terribly ordinary, like "goo goo." Thirdly, she often felt people were sometimes patronizing, almost always without meaning to be, because the advice she got or even the compliments she received seemed to reflect nothing of the mental investment, the spiritual and emotional exertion, the long-night, long-day, stretched-to-the-limit demands that sometimes are required in trying to be and wanting to be the mother God hopes she will be. "It is this realization," she says, "that I try to recall on those inevitably difficult days when all of this can be a bit overwhelming. Maybe it is precisely our inability and anxiousness that urge us to reach out to our Heavenly Father and enhance His ability to reach back to us. Maybe He secretly hopes we will be anxious," she said, "and will plead for His help. Then, I believe, He can teach these children directly, through us, but with no resistance offered. I like that idea," she concludes. "It gives me hope. If I can be right before my Father in Heaven, perhaps His guidance to our children can be unimpeded. Maybe then it can be His work and His glory in a very literal sense." "...In light of that kind of expression, it is clear that some of those ... [shadows under mother’s eyes] come not just from diapers and carpooling but from at least a few sleepless nights spent searching the soul, seeking earnestly for the capacity to raise these children to be what God wants them to be. Moved by that kind of devotion and determination, may I say to mothers collectively, in the name of the Lord, you are magnificent. "We tell you there is nothing more important in this world than participating so directly in the work and glory of God, in bringing to pass the mortality and earthly life of His daughters and sons, so that immortality and eternal life can come in those celestial realms on high." I took comfort in that talk for a number of reasons. First, it helped me to again realize that other mothers have the same thoughts, concerns, feelings, and struggles that I do. It’s easy for me to feel overwhelmed by all the little things that occupy a young mother’s time. I have to force myself to focus more on what I am to be, rather than what I am to do. But even more overwhelming to me than those many little things, is the responsibility that I have, to teach my children "to walk uprightly before the Lord" - to help them develop that strong testimony that is so essential. And the dear Sister that wrote to Elder Holland brought out a wonderful point - maybe it is precisely our inability and anxiousness that urge us to reach out to our Heavenly Father and enhance His ability to reach back to us. One night when I was feeling particularly overwhelmed, I was kneeling beside my bed praying to my Heavenly Father with the question in my mind - of the so many important principles and things to be teaching my children - what was most important for them to be learning at that moment - what should I focus on? As I’m engrossed with this prayer and having, what I felt was a very spiritual experience, in wanders my almost 4 yr. old boy, Cash, who apparently hadn’t yet fallen asleep in his bed. He proceeded to kneel next to me and whisper into my ear the things he thought I should say in my prayer -much like we do with him as he says his own nightly prayers. Being that the Spirit quickly seemed to leave the room, I wrapped up my prayer, took him back to his bed and climbed into my own. As soon as I did so, however, I was immediately touched by the sweet assurance that my prayer was answered - for in that moment, I was doing the thing I needed to be doing most - I was setting an example for my children to observe and follow - the likes that Elders Ballard and Foster refer to in their talks. The entire experience was answer to my prayer in and of itself - had I not been kneeling, saying my prayer that night, Cash would not have witnessed his mother practicing the principle of personal prayer. Indeed, my inability and anxiousness urged me to reach out to my Heavenly Father for help and He did reach back to me. What an honor, what a privilege it is to be a mother, to work so closely with our Father in Heaven in such an important work! When we go to the Savior in prayer and our burdens are shared with Him, they do become lighter as promised in Matthew, "Come unto me, all ye that labour and are heavy laden, and I will give you rest." (Matt. 11:28). And isn’t that the very definition of a mother? A person who labors and is sometimes heavy laden - and isn’t the only thing we sleep deprived women really want is a little more rest? No really, all laughs aside, I know that scripture to be true. In fact when we were expecting my daughter, Vanna, we ran into some complications with the pregnancy and I was put on bed rest for the last trimester. A month before I was due, because of additional complications, the doctor called me in to start my labor before Vanna was put under too much stress. Well we had our beautiful, tiny girl and amazingly she seemed to be doing fine. But that night, she began struggling with her breathing and was admitted into the NICU. The following day, I was to go home and we were unable to leave the hospital with our little girl. This seemed particularly hard for us I guess, as we had already experienced taking a baby home from the hospital following his birth and had enjoyed a perfectly healthy experience with him. I believe we have never had to rely on the Lord so much than at that time in our lives. And when we turned to him in tearful prayer, our burdens were made light. 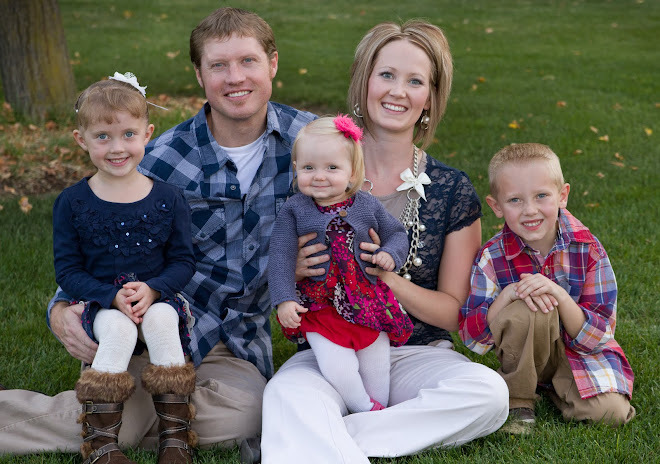 The service we received from others throughout those couple months surrounding Vanna’s birth came in unimaginable proportions-even with the knowledge that no service could be returned as we were moving here to Payette within the month. Such Christlike service. Truly it was a most humbling experience to be loved and served so thoroughly. After 11 days we were able to take Vanna home and what a joy that was. Going through this trial helped me to remember never to take such a thing for granted and among other things, to cherish my calling as a mother to my beautiful children. I do count it a wonderful blessing and privilege to be a mother. It is my prayer that we can fully rejoice in our callings as mothers - and count it a wonderful blessing and privilege to serve the Lord in such a unique way. Even the First Presidency said over sixty years ago, that motherhood was "the highest, holiest service assumed by mankind". I know that a mother’s work is a profound and divine work as we walk side by side with our Father in Heaven in rearing His precious children. Whether our concerns be small, as mine seemed in regard to be overwhelmed with knowing what to teach my children at this time in their lives, or larger such as our experience with Vanna , I know how important it is to turn to our Father in Heaven with our every concern in regard to our children, for they were His before they were ours. Like Elder Holland, I believe you are doing terrifically well! I wish you all a very happy Mother’s Day! I have been married to Ty now for eleven years - he is a wonderful husband and father! We have been blessed with three amazing children! Cash is 9 and is an energetic and animated boy to say the least! Vanna Marie is an independent and beautiful girl who is 7 and who loves to sing and play the piano. Rosalie is our little sweetheart (almost four now) - we enjoy her addition to our family so much! I love watching the kids interact with one another and spending as much time as possible together as a family. *As I was teaching Cash about cows, I would ask him, "What is a baby cow called? ", "What kind of things can we make from the milk we get from cows? ", etc. I asked Cash the following question as well: "What do we call daddy cows or boy cows?" To which he responded, "Cowboys!" - I thought it was a pretty clever answer. * We just got a kitten and whenever he is relaxed and purring near Cash, he is sure to inform us that the kitty "is burping" (it's how he says purring which I think is so cute/funny). *Ty was wrestling around with Cash and said "Cash, you're such a goofball, do you take anything serious?" Cash answered, "yeah.". "What?" asked Ty. To which Cash responded, "macaroni and cheese." *Cash: "twice and a half"
*Vanna is always getting into my lotions and lip gloss and whenever I discover her in the act of doing so, so reassures me that it's okay for her to be getting into my goodies by holding up her hand in a 'stop and listen to me' motion and says, "tiny tiny tiny bit" while pinching her thumb and index finger together. I guess if it's just a tiny tiny bit, it's okay right?! *Cash: "That was totally wicked awesome!" He's so animated - love his use of adjectives! *When Cash gets scared at night we'd often ask him to be brave and try to comfort him by asking him to say a prayer or reminding him that Jesus is watching over him through the night and that we're only across the hallway from him, etc. Lately, however, he will tell us he's all out of brave or that he doesn't have anymore brave. *I still have to help Vanna wipe when she goes big potty so when she asked me to help her the other day, I went in to the bathroom to find nothing in the toilet. She adamately claimed to have gone though so I thought maybe it was just a tinckle and wiped her anyway. Well, when I discovered that she was actually dirty I asked if she went potty again. She said, "yeah in Hank potty-garage." When we were through, she went out to the garage where our cat's litter box is to show me that yes, indeed she had gone poop in the cat's litter box. Ahhh! I guess I should be glad it wasn't anywhere else - but still, how nasty. We had a little talk and I hope it doesn't happen again - it will certainly be a good blackmailing story and looking back, it was pretty hilarious. *Cash: "I'm getting so grumpy at you!" *I asked Vanna to put a pair of her dirty socks in the dirty laundry basked (located in the kids' bathroom). Well, instead of doing as I asked Vanna flushed them down the toilet! I don't know where she's getting these peculiar ideas lately! *When I have to get after Vanna for one thing or another, she'll begin crying and put me on a huge guilt trip by saying, "You make me sad Momma, you bein' mean Mommy!" Ohhh, isn't that so heart-breaking?! I really do feel so mean when she says it. *"Don't get mad - be glad!" The kids saw the Glad (garbage bag) commercials on TV once and they picked up on their slogan right away and are so clever in their use of the slogan in our home. Often times when I get grumpy they'll burst out with "don't get mad - be glad/get glad"! Oh what a quick mood lifter! *Vanna in her loudest voice will sing/say: "I don't know - I been told!" - like the army chant and Cash says it like this: "I don't know what I've been told!" *When the kids were away to Grandmas and Grandpas while I was on bedrest, Cash would occasionally get home sick. My mom told me one day that on one of Cash's particularly hard nights (just before they got to come home), he was listing off all the things he didn't like about his Grandmas and Grandpas homes and one of them was their decorations. He said he only liked the decorations at our house. I thought this was a funny (albeit sad too) comment - it was just Cash's way of saying he was ready to come home! *In his prayers, Ty will often pray that I will be able to "carry the baby to an appropriate time" (or something similar) and Cash has picked up on the idea and so in his regular prayers he will say, "bless that Mommy can carry the baby to the doctor" or "bless that Mommy can carry the baby and not drop the baby". It's really quite darling and quite hilarious at the same time with the way he must be thinking of "carrying". *In her recent prayers Vanna always prays for her baby sister: "Bless the baby can be safe and reverent." *When I have to get after Cash for misbehaving or not listening, etc. and afterwards we talk things over and/or apologize, Cash has been saying, "Do you think you can try harder to be a better mommy?" What he means by this is: Will you never put me in the corner again? ":) After I let the slight sting of guilt wash over me, I then say something real clever and turn it back on him, such as: "Do you think you can be a better listener?" *Rosie snorts when she really gets upset and cries. *Vanna is so good about always randomly saying "I love you" to me every day, several times. Now she also says, "I love my baby" referring to Baby Rosie. So sweet! *As I was giving Rosie a bath when she was only a couple weeks old, she grabbed hold of her hair (she has a whole head of long blonde hair) and locked her little fingers in a fist around it (why is that babies often have their hands in such tight fists? :) and would not let go. She was pulling her own hair. When I finally managed to pry her fingers loose, her head in that area was bright red from her tugging - but she never cried through the whole thing! I just thought it was so funny! *At 7 weeks, Rosie consistently sleeps 51/2 to 61/2 hours for her first stretch at night. Then, after I get done feeding her, she usually sleeps another 2 to 3 hour stretch before she's really awake for the morning. *Also at 7 weeks, Rosie smiles all the time. Early on, she'd often smile just as she was dosing off while nursing, but now her smiles are for real-when she's fully aware. She's such a good happy baby. We're so blessed to have her in our family! * The other day Cash asked me to guess what his favoritest show in the whole wide world was. I guessed Cars 2 (because we just checked it out from the Library and I knew he was excited to watch it for the first time). His response was, "Well, that is my next favoritest...and Scooby Do but what do you think is my very favorite?" I said, "I don't know, you tell me." His reply, "GENERAL CONFERENCE!!!" This proud mom was beaming! *Cash sometimes calles cigarrettes "smokearrettes" when he's trying to explain that he saw someone smoking and that it's not good for you, etc. etc. Vanna: I know how to make you say "how". *Vanna has always been so good to tell us she loves us and for months now, just randomly, she will come up to me and/or Ty and say, "I love you with all my heart." It is the sweetest thing and certainly melts your heart! *The other day in the van, the kids pulled out their scriptures (they like to carry them along with us in the van) and Vanna started: "Chapter 1, and it came to pass...." I thought it was so funny that she recognizes that common phrase in the scriptures and repeated it on her own. *A friend of ours had a 8-yr. old (Macie Jensen) who was being baptized and when she was asked who she wanted to speak at her baptism, the young girl said, "mmm...Vanna". Her mom had to explain that Vanna was probably too young to speak and that maybe it would be nice to choose someone from her family to speak. She shared this with me and I thought it was so sweet, I had to record it. *Vanna - "Do I have school tomorrow?" Vanna - "Awww man (in her best drawn out whiny voice)." Mom - "Don't you like school?" Vanna - "Well, I DO like the snacks." *Cash came home the other day with a new song he's learned from school: "Girls go to college to get more knowledge, boys go to Jupiter to get more stupider!" Funny he didn't use it to his advantage and switch the girls and boys around. :) Anyway - where do kids come up with this stuff right?! *Cash and Vanna were at their friends' house playing in the back yard when the neighbor came out and yelled at them to "get the h... away from her property before she calls the police" and the like. You can imagine how this upset all the kids who didn't even realize they were near her property line. It just so happened that I was there to pick the kids up right after this happened and when we pulled into our driveway, the waterworks began. Cash particularly wouldn't settle down. He kept saying, "I don't want the cops to come and put me in jail!"